Whether I am at home or dining out I rarely eat two pieces of bread or roll when having a sandwich or burger. Either I take off the top piece and hand-hold by the bottom bread and a lettuce leaf on top or I eat my sandwich with a knife and fork. I have been doing this for so long that when I do eat the whole sandwich it is just too much bread! 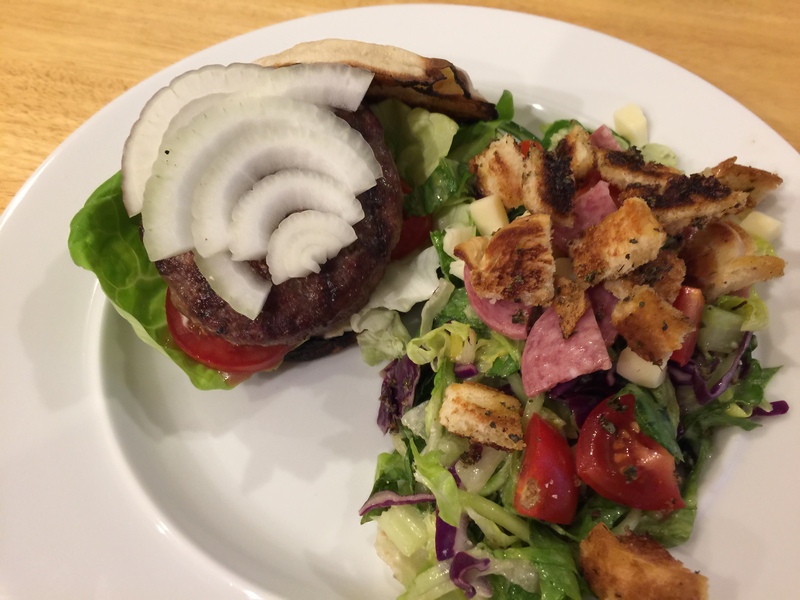 Tonight’s burger was almost a lettuce wrap plus we reduced the amount of meat by an ounce in each burger. Gotta say I did not miss it! There are so many little things you can do to take control. Try one of my tips the next time you have a burger or sandwich! This entry was posted in Beef, Healthy tips, Vegetables and tagged diet, ground beef, Onions, Salad, tomatoes, Vegetables. Bookmark the permalink.